Madden Football is one of the most successful video game franchises of all time. The very first version of the game was released in June of 1988 for the Apple II. Its hard to believe, but this game did not have a license from the NFL or NFLPA to use team names, player names, and stadiums. Try doing that to fans of the franchise today. I don’t think it would fly. Although one of the features of the game did allow players to create their own team. In theory you could name your team after a team in the NFL. Electronic Arts had a hit with Earl Weaver Baseball, so it only seems natural they would take what made that so successful and transfer it to other sports. Football was next on their list, and John Madden Football was their answer. The game was praised for it’s customizable aspects such as weather, time of quarters, player fatigue, injuries, and penalties. No season play though, just single games. Many fans enjoyed it because the game had a “Quick Mode” that allowed for arcade-like play, and a “Standard Game” which could go into much more detail. The Madden Football franchise has generated billions of dollars in sales since it was first released. 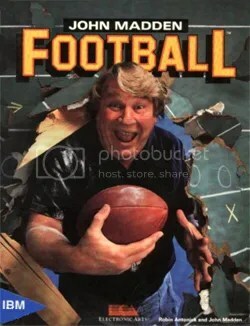 It was funny to learn that John Madden wasn’t the first choice to endorse this game. First on the list was Joe Montana, but he already had an agreement with Atari. Second was Cal coach Joe Kapp, but he wanted royalties. Finally they landed on John Madden, and the rest is history. Original copies of the 1988 game sell for $45.00 to $65.00. For those people getting new consoles and playing Madden NFL 15 this Christmas, this is where it all started. I think Topps and EA Sports should get together and integrate trading cards within video games. Somehow they need to combine the Topps Huddle app with Madden so players can earn exclusive online cards through the game.